The Amaryllis is blooming! It only has 2 flowers but what beauties they are. I have never seen this coloration before. 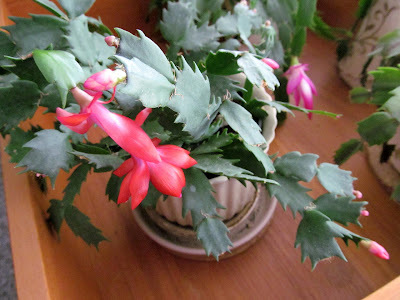 My smaller red cactus is blooming again and there is a pink and white bloom behind it on another plant. I needed a day of rest yesterday so I pulled the Kaffe fabrics for the next batch of squares but I didn't do any cutting or sewing. One of these prints may make it into a butterfly block too. I have a package to mail (another sale from my pop-up shop) and a run to the grocery store and then I hope to cut and sew today. WOW, WOW, WOW, what beauties you have. That Amaryllis is gorgeous! I need a rest day today! I was so tired from my short night on Friday night that it made Saturday a struggle. I hit the grocery stores on the way back home from the salon. I still have couple tote bags of groceries that still haven't made it up to the kitchen. Those flowers are spectacular and they look even better against your wall color/black and white mirror backdrop. And congrats on the sales in your pop up shop!! I don't know the name of that amaryllis but it makes a statement. I have one that has multiplied numerous times. They are planted on either side of a crepe myrtle. Always a fabulous show in the spring. I live in the South so mine are planted outside. I always love to see what you've been up to. Your blog is the first one I look at every morning. I can't believe how much you accomplish every single day. It's amazing and puts me to shame. 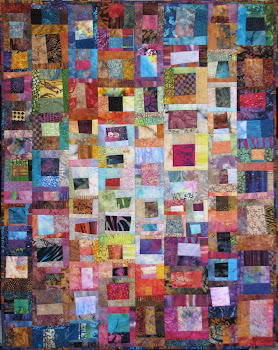 One question I have is how did you accumulate all your fabric because it seems like you have an endless supply? Very pretty flower, has the look of a vintage plant my grandmother had here, a rubrum lily. 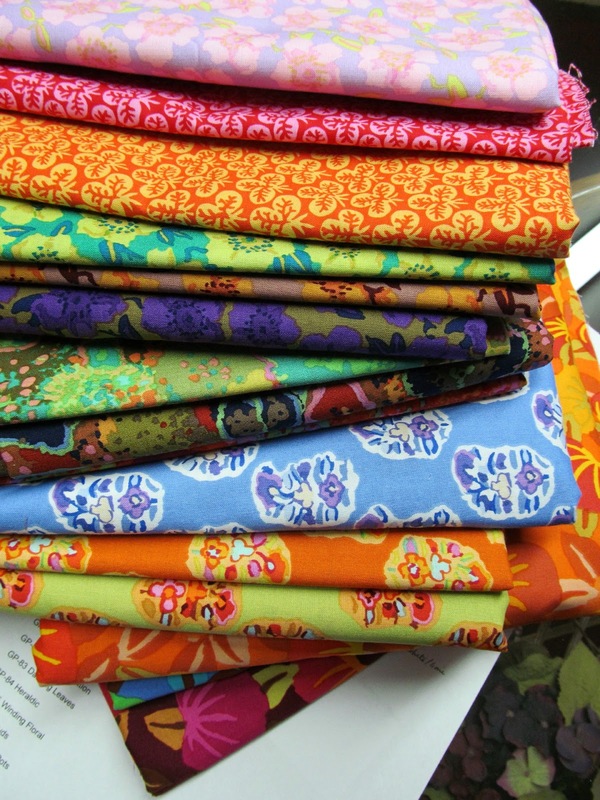 Lovely blossoms and display of fabrics, Wanda. I too have never seen an amaryllis blossom like that. The flowers are oh so inspiring. 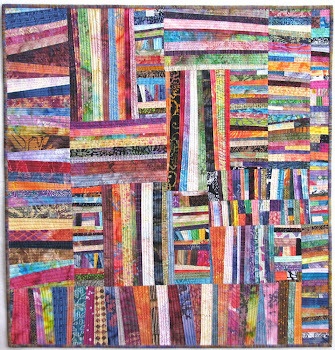 The fabric is eye candy. Hope you get to your cutting. 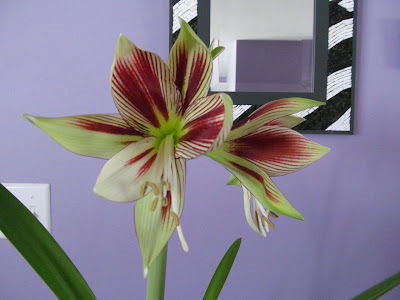 Wow....I have never seen an amaryllis in that color. It is gorgeous. I bought a planter with two amaryllis bulbs at Costco before Christmas, but sadly, while they both have buds, they will not bloom before we leave for FL on Monday. So i need to find someone to gift them to and hope it's not too cold this weekend to transport them. Guess I won't do that again.